There's nothing more frugal for a Friday finish, than using what you already have....and finishing that which you already started. Feeling frugal in both attitude and practice is always a call to action. And of course, it's a lot more fun, maybe even easier, to want to feel creative and to begin new projects at the simplest spark of a thought. But it's crunch time, and we're not only crunching financial numbers, but budgets and self-control. So, with that in mind...four finishes from Finn's New Year's Eve Challenge. And yes, the challenge was for last year, but I ended up on Alaskan island for those last 4 months....and priorities changed to helping very ill parents, instead. But now, 'finn-ally', I have all four projects finished. 1) final quilting and binding re-do on a collaborative album quilt started eons ago 2) final quilting, binding and labeling on my uncle's Patriotic Heartstrings project 3) that pink ruffled baby quilt for someone in need using a quick finish quilt panel and 4) finally, my frugal Friday "Service Day" quilt made of small left-over scraps for a community donation quilt. Sometimes, the easiest of things to finish become the longest to actually take care of and be finally done with! 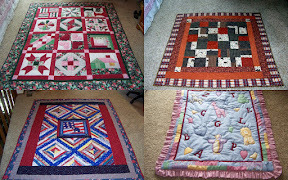 Oh, I don't even want you to notice that one of these started out with hand-quilting the blocks and ended up with some machine quilting...but I didn't have another eon to finish it! And sometimes feeling frugal involves time, space, and energy.... as well as materials and purpose. What a wonderful feeling to be done with all of them and know they will all go to good homes! I can't imagine any better feeling in the whole world, well done! They all look so beautiful...especially the one to your uncle. Wow! Four fabulous finishes! Congratulations. You're right, being frugal has to do with a lot more than money. Your time, space and energy also count, probably more than money. Four, how wonderful to have finished so many projects. I have started sewing leaders and enders in hopes of using up some of my scrap pieces. I have way too many as I keep even the smallest pieces.